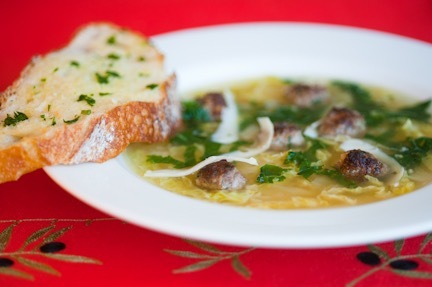 Mini meatballs are simmered in a chicken broth with mellow greens then topped off with Parmesan cheese. There's nothing better or more comforting for a winter dinner. It's a great soup to serve guests as well, with a grain-green salad. The meatballs, about an inch in diameter, are cooked in the oven for about 12 minutes - how easy! Make meatballs by mixing the ground beef, bread crumbs, water, parmesan cheese, garlic, oregano, parsley, salt and pepper together in a bowl. Roll into approximate 1-inch balls and place on a baking sheet. Preheat the oven to 375°. Refrigerate the meatballs and begin making the soup. In a soup pot, heat the oil in a thick-bottomed soup pot over medium-high heat. Sauté the onions for about 10 minutes, until golden, stirring often and scraping the bottom of the pot to prevent sticking. Add garlic and cook another minute over low heat. Add chicken stock, 1 teaspoon of salt and bring to a boil. Add carrot, kale and Savoy cabbage, turn down to simmer, cover and cook about 15 minutes. While soup is simmering, bake meatballs for about 12 minutes (they don’t brown up as much in the oven as they would sautéed in a pan, but that’s okay). Remove from the oven and add to the soup, simmering about 5 minutes to meld flavors. Taste the soup and add more salt and a few grinds of black pepper. Ladle into soup bowls. Garnish with a few shavings from the parmesan cheese – a vegetable peeler works great for shaving off nice pieces. Pass the cheese and a grater at the table in case people want to add more cheese. *Savoy cabbage is the crinkly green cabbage, a bit milder than regular green cabbage, which I don’t think would be as good in this soup. If Savoy cabbage is not available, replace Savoy with escarole. Variation: Add cheese tortellini to the soup. Keep the kale, but take out the celery and cabbage.